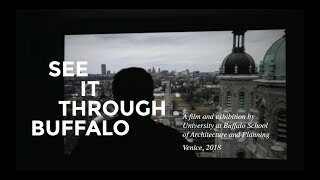 This film gives us a chance to share Buffalo with the world. What people find is a more complex city than they might have realized. "The exhibition shows some of Buffalo's best and most challenging conditions. Every segment of the film describes some aspect of our scholarship of our learning and our fully engaged work in the community, not as a promotion but as an inquiry. How do we bring a city not back to what it was but what it needs to be in the future?" "There are a lot of questions about how to rethink the City of Buffalo in the 21st century. We have these sights that are kind of asking for some kind of intervention in some way. So the City of Buffalo drives us as a school, but then we in turn are driving the city." "Buffalo has had its ebbs and flows but I think we're in this space of revitalization, where there's a lot of pride for Buffalo and a lot of passion to be building, making."